NASA hosted a 3D-printed habitat competition for future Mars exploration. Pixelated sushi was showcased at this year’s SXSW. Forbes reporters were able to unlock phones with 3D-printed heads, while the maker of 3D-printed guns attempted to sell blueprints to elude a court order that banned him from giving the plans free of charge. 3D printing was everywhere. As 3D printing technology is becoming more and more accessible to consumers, companies are refining their own printing processes. Also known as additive manufacturing, 3D printing has been used in manufacturing, medical, industrial, and sociocultural sectors to become a successful commercial technology. 1981: Hideo Kodama describes a functional rapid-prototyping system using photopolymers. A solid, printed model was structured in layers, each corresponding to a cross-sectional slice in the model. 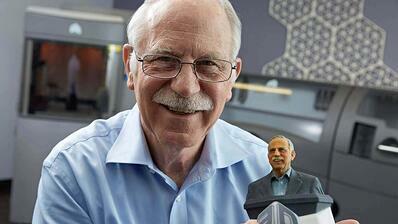 1984: Charles Hull made 3D-printing history by inventing stereolithography. Stereolithography lets designers create 3D models using digital data. 1992: Hull’s 3D Systems created the world’s first stereolithographic apparatus (SLA) machine, which made it possible to fabricate complex parts in a fraction of the time it would normally take. That same year, startup DTM produced the world’s first selective laser sintering (SLS) machine—which shoots a laser at a powder instead of a liquid. 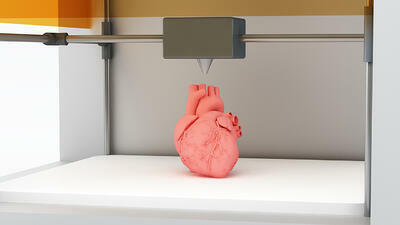 1999: The first 3D printed organ was implanted in humans. Scientists at Wake Forest Institute for Regenerative Medicine printed synthetic scaffolds of a human bladder, coating them with the cells of human patients. The newly generated tissue was then safely implanted, as they were made of their own cells. 2005: Dr. Adrian Bowyer’s RepRap Project launched an open-source initiative to create a 3D printer that could basically build itself—or at least print most of its own parts. 2008: Darwin, a self-replicating printer, was able to do just that. 2017: Engineers at MIT have used 3D printing to create a microparticle that can be filled with doses of drugs or vaccines, sealed, injected into a patient, and biodegrade at predetermined rates, releasing the drugs or vaccines into the patient’s system on a specific schedule. With ongoing innovations in material manipulation, printing speeds, and certain processes (such as SLS), 3D printing is likely to transform manufacturing as we know it. And combined with cloud computing, IoT connectivity, big data, and next-gen robotics, you start to see the projected future of industry: a “smart”, adaptable factory that optimizes and rebuilds itself. The following data from Juristat Platform provides a further glimpse at the patent landscape for 3D printing. 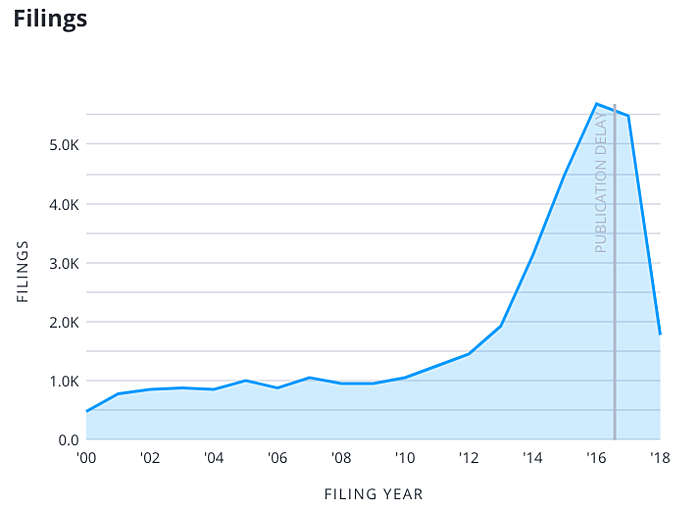 When searching for patent applications including the terms “3D printing,” “stereolithography,” or “additive manufacturing”, we were able to find approximately 40,000 applications filed since 2000. 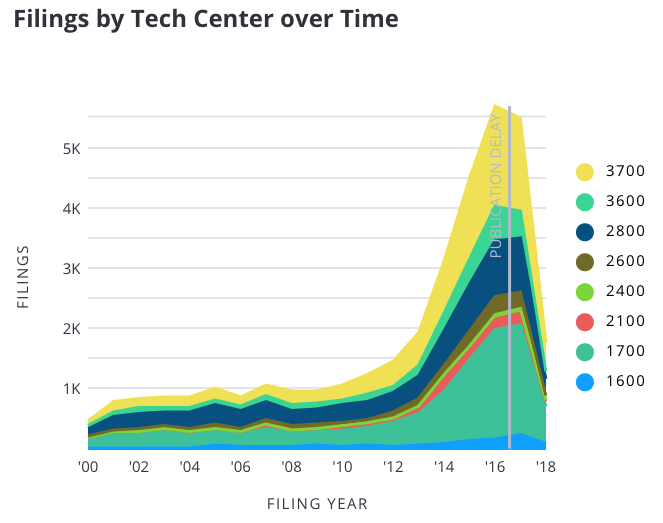 As you can see in the graph below, there was a steep increase in filings between 2010 and 2017. The release of the Darwin self-replicating printer in 2008 likely kickstarted new explorations (and patents) of 3D printing technology. The top assignees of disposed and pending 3D printing applications reveal an interesting collection of companies. The lists include big-name conglomerates invested in healthcare research and development (General Electric, Siemens), aviation (GE, United, Boeing), and energy (GE, Siemens), as well as an innovator in the field itself, 3D Systems. And on the consumer products side, we see Nike, which has been making some impressive strides (excuse the pun) in the application of 3D printing for sportswear and apparel. These two lists give a glimpse into the wide-ranging uses of 3D printing technology. As you can see, 3D printing applications are most often subject to § 103 rejections. Under § 103, a patentable invention must be a non-obvious improvement over prior art. We suspect that 3D printing applications are more susceptible to these rejections because they are often adaptations of existing technologies or processes. 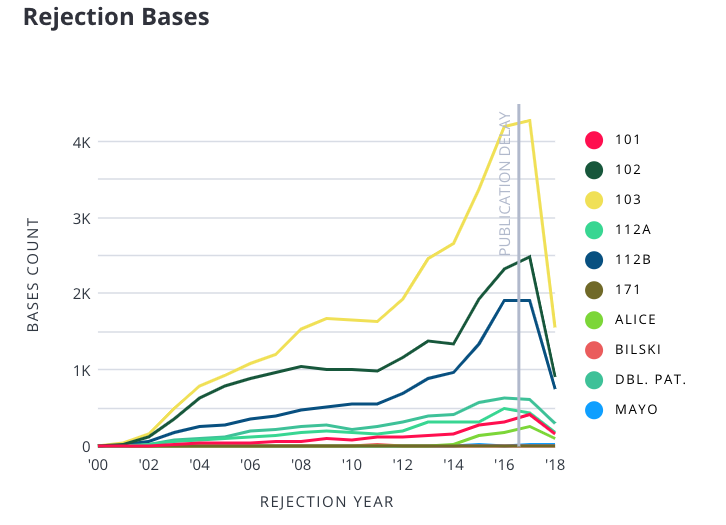 It's also important to note that § 103 rejections are the most common rejections in the technology centers where we often see 3D printing applications. Technology centers with the most 3D printing-related filings are TC 3700 (Mechanical Engineering, Manufacturing and Products), TC 3600 (Transportation, Electronic Commerce, Construction, Agriculture, Licensing and Review), TC 2800 (Semiconductors, Electrical and Optical Systems and Components), TC 2600 (Communications), and TC 2400 (Computer Networks, Multiplex, Cable and Cryptography/Security). With the boom in 3D printing-related patents in recent years, we predict the technology will continue to grow and become even more widespread. And it appears industry leaders agree. Mark Spiwak, the recently retired President of Boeing Satellite Systems International (one of our top 3D printing assignees), said last year that the technology has become “part of [the company's] standard design processes." Identifying emerging technologies like 3D printing is imperative to developing a healthy patent portfolio and remaining competitive. With Juristat Platform, you can identify your patent competitors, understand which of their applications are most relevant to your own prosecution, and monitor those applications for new developments. Are you ready to try Platform? Sign up for a demo today.